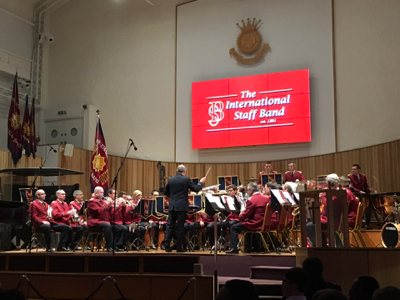 The title of the program at Regent Hall Corps on 25 March 2017 was Fusion, one of many hints that the International Staff Band (Bandmaster Dr. Stephen Cobb) would be seen as never before. But no one could have been prepared for the wealth of music – traditional and contemporary, brass and vocal, played by musicians young and old. Tremendous credit is due to the members of the ISB who managed to find time in their already packed schedules to pass on their musical knowledge to the youngsters. As Bandmaster Cobb commented, “It’s amazing how much you can assimilate and achieve in an afternoon.” Gems such as Leslie Condon’s Blyth Heritage were among the eight items, ranging from marches to reflective pieces, and even a tango, that were presented to a delighted audience. Later in the evening, the young people, standing on both sides of the balcony, united with the Staff Band standing on the stage, for a great performance of Southdown (Ray Steadman-Allen). There was even more variety to come before the main event. The London Youth Choir (Leader Nick Hampton), consisting of young people aged from 12 to 25, provided an excellent selection of songs to a hall that was rapidly filling with people. The first half of the program was traditional International Staff Band, with items including the festival march Faith Is the Victory (James Curnow), Wilfred Heaton’s exciting toccata Oh, the Blesséd Lord, and the exquisite Jesus, Good Above All Other arranged by Geoffrey Nobes in a similar style to his Prelude on “Lavenham”. Carl Nielsen (cornet) played Wondrous Day (Erik Leidzén), which Bandmaster Cobb reminded that audience was written for his father, Roland Cobb, some 60 years ago. Derick Kane (euphonium) gave a lyrical performance of Some Glad, Sweet Day. This solo was sketched by Bernard Tovey, a former euphonium player with the Staff Band, and completed 47 years later by his son, Bramwell Tovey. Some music is timeless. The first half concluded with Eric Ball’s epic Song of Courage. The composer listened to a radio broadcast in 1940 in which a minister of religion said he could not pray for happiness for his listeners as, with World War II raging, no one knew what was in store. However, he could pray for courage so that they could face the challenges and evils that surrounded them. Bandmaster Cobb referred to the tragic events of Wednesday, 22 March 2017, at Westminster, when in 82 seconds a crazed terrorist killed four people. It is always a wonderful experience to listen to Ball’s music, but for an audience still devastated by what had happened there was a special poignancy in hearing the chorus and the associated words, “Stand like the brave, with thy face to the foe”. For the second half, the Staff Band returned to the stage dressed in polo shirts and assumed a big-band formation. Regent Hall has been refurbished to concert hall standards, with state-of-the-art sound and lighting effects which were fully exploited to enhance the music. The items now predominantly more modern composers and contemporary arrangements of traditional songs. Martin Cordner’s Pulse (the composer was in the audience) was inspired by a worship meeting. The music, which includes the songs “Refiner’s fire”, “Teach me to dance”, and “Holy, holy, holy”, challenges the listener to lead a life of integrity be responding to God’s leading, with “pulse” referring to the beating of the heart. Richard Woodrow (flügelhorn) played a swing-time version of the old song “Down where the living waters flow”, arranged by Australian composer Sam Creamer. He also arranged the tune “Hardy Norseman” in uptempo swing style High Over All, which was featured later in the program. Dramatic lighting effects were brought into play for Swiss composer Markus Frei’s 007 Light, a funk-rock treatment on “This little light of mine” with more than a passing reference to the James Bond theme. Shekinah (Kenneth Downie), a tranquil reflection on the words “Spirit of the living God, fall afresh on me”, demonstrated that not all big-band music is brash and loud, but can be a beautiful aid to meditation. Sidney Cox’s well-known song “What a wonderful day” was given a Glenn Miller treatment in a gentle, laid-back swing arrangement. The ISB vocal group’s rendition of God’s Still the One featured Paul Sharman’s deliberately overplayed piano introduction, following which the group launched into a skillfully choreographed performance of this evergreen comic item. Amusing as this was, the words still had a serious meaning, “God’s still the one who’s promised to care for you”. As the mood quieted to the devotional part of the concert, the band played Peace, Perfect Peace (Howard Davies), which marries the title hymn with “Abide with me”. There was appreciative silence following the item, which provided an antidote to a shocking week. The concert ended with To Boldly Go (Peter Graham). This rousing composition was writtern for the Melbourne Staff Band’s 125th anniversary in 2015. The ISB was privileged to share in those celebrations. Fusion was a tremendously enjoyable experience and the audience left known that the following day they would hear more inspiring words and music from the International Staff Band, coupled with the normal traffic-stopping march of witness down the crowded Oxford Street. This article was posted in News and tagged Carl Nielsen, concert, Derick Kane, International Staff Band, Jan Ambrose, London Youth Choir, Nick Hampton, Noel Wright, Paul Sharman, Regent Hall Corps, Richard Woodrow, Roland Cobb, Stephen Cobb, workshop on 28 May 2017 .